Lyme Disease is exclusively transmitted by deer ticks (Ixodes scapularis), who’ve earned their name by regularly parasitizing deer. Also known as black-legged ticks, these pests are also regularly found on animals including mice, rats, bats, squirrels, and migratory birds worldwide. Bird-X proposes a common sense prevention technique: Keep the host animals away from your home and yard to create a tick-free oasis for your family. While fences are helpful, they can only go so far to keep host animals out. Bird-X’s products work to prevent host animals from ever entering a property, which is advantageous in the matter of ticks. Unlike snap or glue traps, poisons, or catch-and-release methods, keeping the animals away in the first place eliminates the ticks’ ability to move from the host animal onto lawns, trees, bushes, or other tick-friendly surfaces. The Yard Gard in particular targets tick-carrying animals, including deer, raccoons, squirrels, rats, mice, bats, rabbits, skunks, possums, as well as stray cats and dogs. It does not harm pets or any of the animals listed, it simply emits a silent-to-humans ultrasonic frequency that these animals find irritating, which forces them to avoid the treated area. 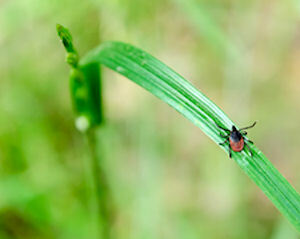 “My sister had Lyme Disease a few years ago. Like many, it went misdiagnosed for quite some time since her only early symptoms were fatigue and headache, which lead to more serious complications later on. Prevention is something I take very seriously. I don’t want anyone to go through what she went through,” stated Kelly Nelson, Media Correspondent for Bird-X. For more information on tick and host animal control, visit www.bird-x.com. May 2014 has been named Lyme Disease Awareness Month, due to “Staggering diagnosis rates and the makings of an epidemic in Pennsylvania” (source). Doctors prepare to handle thousands of cases as the weather continues to warm up and more people venture outside (source).